"If you are looking for a place for more than entertainment, this is it! D.M. is very unique, you are not just watching the big screen, you are IN THE PICTURE. The staff will lead your group to new heights, challenge them , promote communication and team work and let them develop life long relationships and memories. Our kids talk about camp all year long. D.M. is truly PRICELESS!" 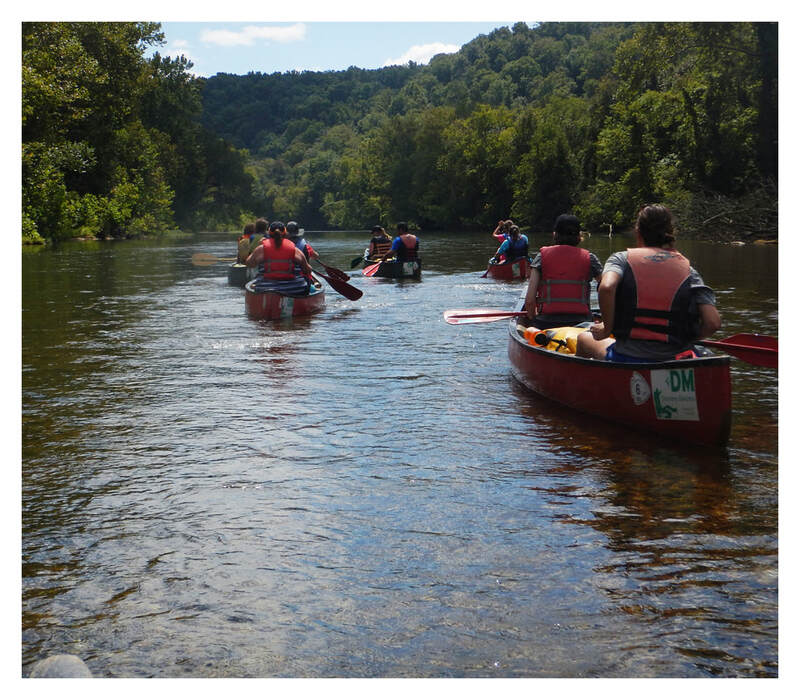 Let us put you on the float trip of a lifetime as you take a day's journey down one of the National Scenic Rivers in the area. Discovery Ministries offers opportunities to float on the Jacks Fork and Current Rivers. These are two of the most beautiful rivers in the U.S. and offer many great opportunities to see natural springs, play, fish, and relax. 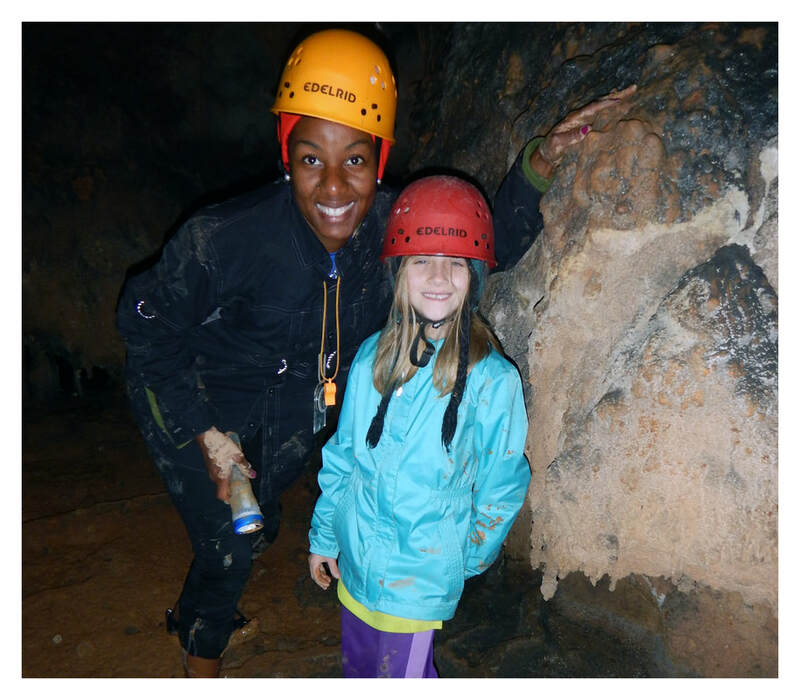 Caves have beautiful formations and fun opportunities to explore and experience God's creation first-hand. On your caving trip, Discovery Ministries staff will guide you in the cave and engage your group in a devotional challenge. 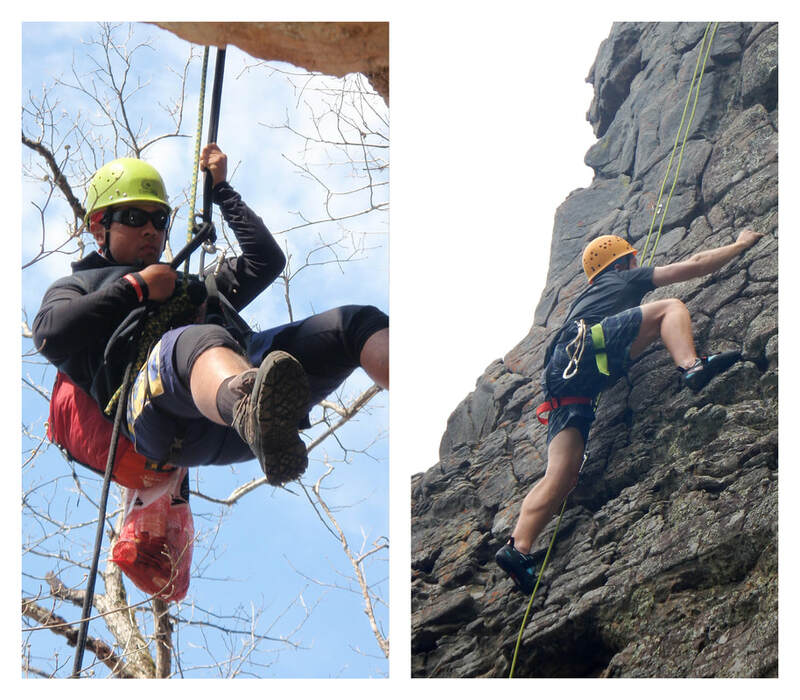 We'll lead you to the “Rock” that is higher than ourselves by facing our fears on some of the best local Missouri stone around. Our experienced climbing instructors will give you some serious beta both on the rock and for your spiritual life. Rock climbing is a mental, physical, and spiritual challenge, boosting a participant's sense of accomplishment when they conquer a climb that is at the far reaches of their abilities. Included in a day of climbing, participants will also be challenge with rappelling. Discovery Ministries instructors will take the time at the end of a day of climbing to help participants transfer learning from the wilderness to daily life and relationship with God. Okay here's the recipe. Take one salty DM instructor, add lots of imaginative and interactive puzzle pieces and mix in your group. Voila! You have creative, Christ-centered team building. Taste's kinda spicy! Group Initiatives are problems whose solutions depend on the ideas and efforts of every group member. Our goal is to teach participants how to function effectively together. On our low ropes courses, as each individual conquers 3 or 4 balance obstacles, the group spots to protect from injuries in case of a fall. The course creates a physical challenge that engages participants mentally, emotionally, and spiritually and helps them transfer lessons to the obstacle course of life. On the ground, group initiatives are mental and physical challenges that teach practical applications about Christian discipleship and working together. Much like a coach uses drills to develop playing skills, we use group initiatives to develop living together skills. Be sure to let us know your goals. What your group learns in this session depends upon what the group needs. Take the same key ingredients from our group initiatives recipe, add some fear mixed with balance and serve it up high. 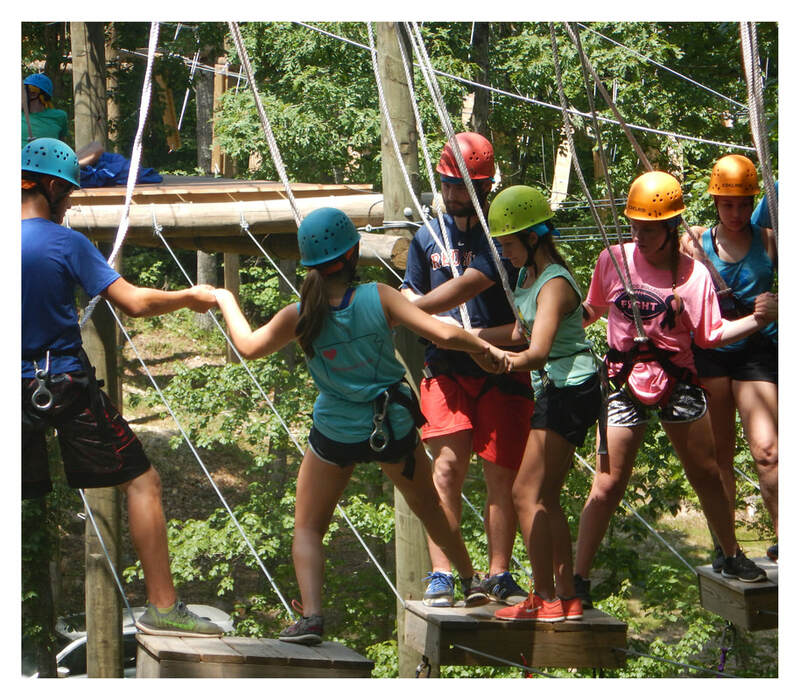 These challenges are designed to involve all group members in order to accomplish a high ropes course element. The elements range from 15-40 feet off the ground. You will face your fears while also learning more about the God who conquers all fear. 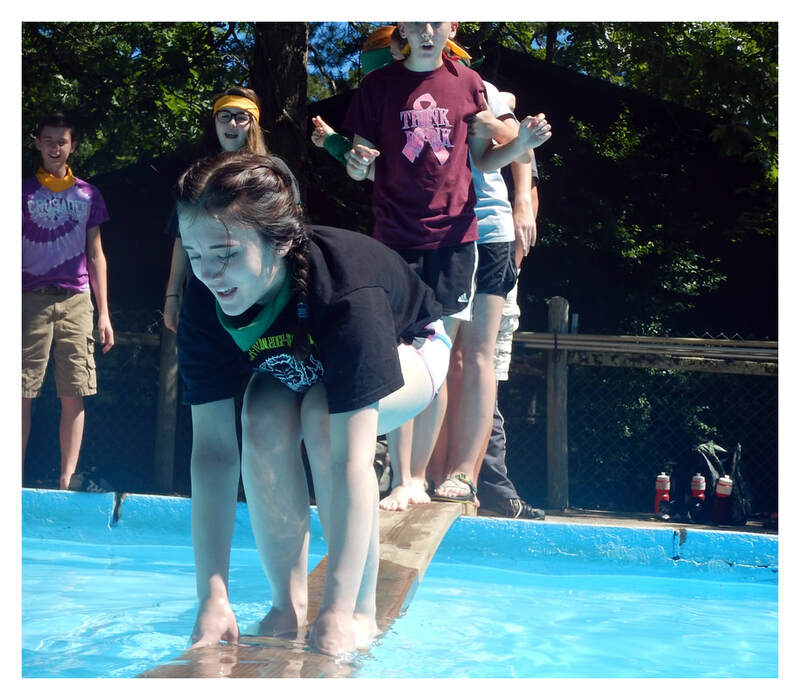 WALK THE PLANK: Step out in faith as your group holds up your walk way. DANGLE DUO: Grab a partner, scale a giant ladder, and traverse this high ropes element while relying on each other. MT. ZIPPIES REVENGE: Rely on your group to reach the zipline platform that sits 30 feet in the air. This initiative ends with a 650 foot zipline! CHALLENGE VALLEY: At 40 feet up, you and your group will spend an entire day (4-8 hours) conquering fear while you collaboratively work through elements that will test you physically and mentally. If you've ever wanted to just “lose yourself” in nature we can do that for you. 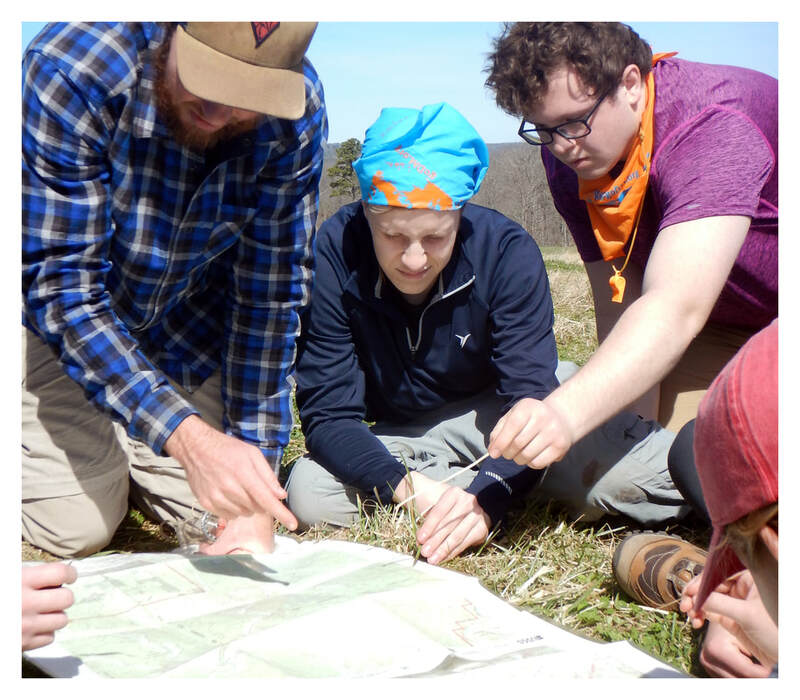 Our instructors will teach your group the principles of back country navigation and principles for navigating the Christian life. Orienteering is a group initiative with real life consequences--Getting Lost. We teach the group to read a map and compass, then drop in the middle of nowhere (or so they think) and give them destinations. Wherever they lead, we go. Orienteering provides an opportunity to experientially learn about the importance of the task versus the process. This is an excellent activity for group development, leadership, and communication.